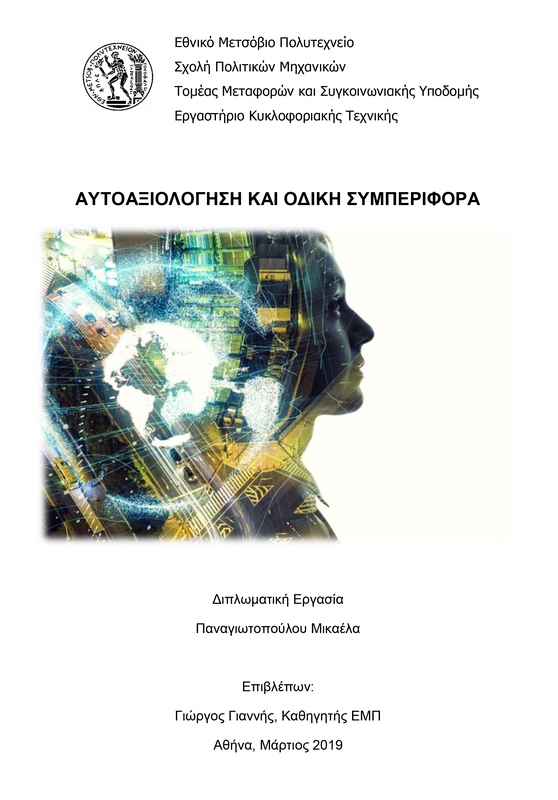 Mikaela Panagiotopoulou, “Self-assessment and Road Behaviour”, Diploma Thesis, NTUA, School of Civil Engineering, Athens, March 2019. The aim of the Diploma Thesis is to relate self-assessment and other characteristics of drivers with parameters of their road behavior. To achieve this goal, a pilot simulator experiment was conducted and a questionnaire was filled in a sample of 125 drivers. The collected data from the questionnaires were grouped using the factor analysis method. Subsequently, linear regression model was developed. The application of the models revealed that the drivers who have positively self-assessed their driving abilities drive faster and showcase speedy reaction time. The drivers in general, evaluated realistically their driving skills with an exception when it came to the safety driving measures which were: keeping an adequate headway from the vehicle in front, accurately adjusting their speed on different driving conditions, maintaining speed limits.